Mona B. Rowen Canvas Handbag | P.C. Fallon Co. The Rowen handbag by Mona B. brings together upcycled canvas, antique hardware and leather to create a unique handbag full of style. 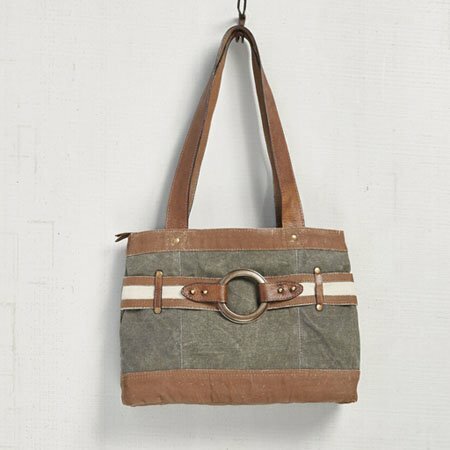 Grey canvas is trimmed with brown canvas handles and accents. An eye-catching metal ring is held in place in a multi-textured belt across the front. Double leather/canvas handles have a 9" drop. Zippered closure. The interior is lined with the signature Mona B. cotton lining, and contains 1 zip pocket and 2 slip pockets. Dimensions are 13.5"W x 10"H x 3.5"D. Made from up-cycled canvas military tents and truck tarps. The fabric shows the history of its travels which may include stitch marks, minor staining and unique scars and bruises. Color variations and patches add to the uniqueness of each bag. Heavy cotton canvas.